Black Rock Swimming Pool, circa 1947, empty of bathers and spectators after war damage repairs, viewed from the east end of the pool. From the late 1945 to about 1966 I lived in Bennett Road. Black Rock was another of our playgrounds. The ladder beach was the beach where we went with our mum for a bit of sunbathing and generally having a good time in the rock pools at low tide. There were endless things to see in the beautiful little pools that the tide had left behind. My kids also enjoyed scrabbling around among the rocks that were a haven for wildlife. The short cut to the beach was via the ladder. But families with young kids, and older folk usually went down the steps further along the beach. When I was a kid the beach was very low, and the ladder long. Later on in life when I paid Brighton a visit I was surprised to see that the beach was very high and the ladder was very short, most of it buried in the stones. When we were a bit older Black Rock bathing pool was one of our happy places in the summer. I was very sad when it was demolished, it was such a lovely looking place, and very lively and happy. I think that it opened in April or May, and was freezing at the beginning of the season, but we couldn’t wait for it to open, that meant that summer was on it’s way. In the winter it was a different playground. The bathing pool was empty of water and we walked around it, and sometimes played football in it. There were rusty places in the paint on the railings where the salt water had found it’s way in. But in the spring the paint was renewed and sparkling again. I can remember climbing to the top diving board in the pool and wishing I never had. It seemed so high, but once you were up there you had no chance of going back down, you had either to dive or jump off. But after a few scary moments it was ok. From the photos this top board doesn’t look very high, but to us kids it did. The undercliff walk was a favourite walk on Sunday mornings. We would walk to Ovingdean and back home along the cliff top. Later on we would ride our bikes with fixed wheels and cowhorn handlebars along the sea wall on the undercliff. The wall was only about a metre high, but on the other side was a good drop onto the beach. We never came a cropper thankfully, more by luck than judgement. Another few fond memories of Black Rock before the Marina was ever thought of. But the Marina is a playground for other generations just as we had in our time. Loved this place as a teenager. Lived in Belgrave Place ’55 through ’59. Spent four very happy Summers there before joining the RAF as an apprentice in 1960. Well remember the tide pools too Mick. Ian Hunt Alberta, Canada. P.S. And at 67 still swimming three times a week albeit in the local indoor pool. 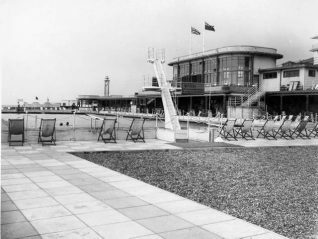 Like many in the middle 50s- early 60s, Black Rock swimming pool was the place to go. Laying out in the deckchairs, after dips in and out the pool, listening to all the latest pop music blasting out from the Tannoy, drinking our bottles of water and eating our sandwiches and just relaxing, it was a real shame when it closed. Being very fair skinned and young and silly, I remember one occasion being very sunburnt and laying on my bed for several days, unable to move. I soon learnt never to do that again and I didn’t. I used to take my eldest daughter Mary there from 1968, until it closed and with others had some great times- oh, to turn that clock back. Black Rock was fantastic in the 70s. Me and my mates had great times down there, although I was not a good swimmer. I just used to go for the girls. At low tide you could bunk in by walking round from the ladder beach. And yes I remember those ladders being quite high. Another way to bunk in was from the top viewing area up the east end and climbing down. I remember the high diving board. Don’t remember many people diving off it though. Didn’t they take it away because someone got hurt? As you came in they had those funny old gate things and an ice cream shop on the corner. When the pool finally closed I went and took some pictures of the area, I’ve still got them in an album. They look so sad. All that broken glass, empty pools – the large swimming pool and the kids’ paddling pool. I’ve got a picture of the First Aid post door with all its peeling paint. But the best bit I’ve still got a great souveneir – the metal frame you hung your clothes on and put your shoes in the bottom. That’s still hanging in my garage. I wonder if any others exist! Mr Gumbrill, I’m sure everyone on here would love to see these photos. I know I really would! Could you add them to this site please? I have very fond memories of Black Rock too. Squashed wet sandwiches being one of them! Hi Andy – how are you doing? I remember those galvanized steel clothes hangers, they used to be numbered and you used to get a brass disc with a number on, you used to pin it to your trunks. I used to go to Black Rock with Pete Skelton, Mark Pierce and Carl Edwards, we all lived in Rugby Place and we had many great days there in our youth. 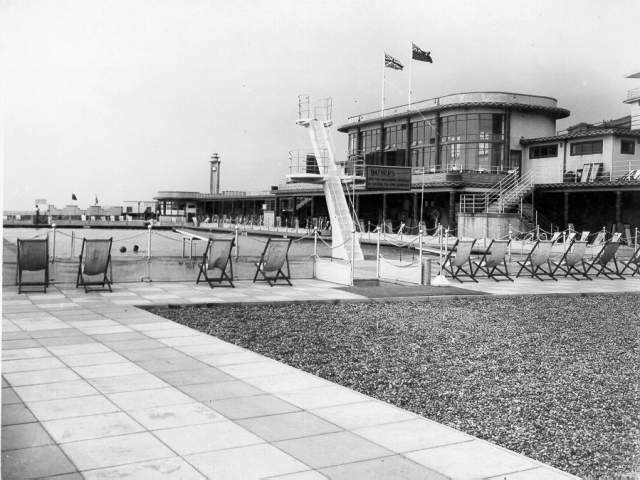 I remember, and probably you do to, drinking in the Bathing Machine Bar which was on the upper deck of the pool. I think it had a late license in the 70’s and I’m sure it was still open after the pool was closed down. You probably know Mark and Carl are no longer with us, but I have fond memories of swimming and having fun in Black Rock with them. Yes please – me too! A large part of my childhood memories are of the Black Rock Pool. Hi Micheal. Yes I remember you. We gave Carl a good send off. Me and Robin were the only ones left at his funeral, with Lorraine we watched the sun all go down together. In your road at the end there was a derelict site with boarding up. Did it have an old plain engine behind it? Yes I will add the photos if I can learn how to do it. Oh the memories of those metal clothes holders- lugging them along the cold wet floor to pick up your numbered disc which you pinned proudly to your bathers. I remember losing my disc once and having to wait until they practically closed before they let me behind the counter to find them. I nearly froze to death .. oh happy days. Hi Andy, you’re quite right about the aeroplane. Back in the 60s there used to be a derelict area at the end of Rugby Place which was once I believe to be a laundry. The site was left undeveloped for a number of years and cordoned off with large wooden fences, but not quite large enough to keep out young inquisitive minds. Amongst the rubble sitting in the middle of the site was an old pre 1940s aeroplane, the wings were removed but the engine, cockpit and fuselage were intact. As you could imagine the kids from the street used that area as a playground for building camps and stone fighting etc. This all came to an abrupt end when someone set fire to the aircraft, the fire took hold very quickly, the wood and fabric were ablaze when the fire engine arrived. Not long after that the site was redeveloped into what is now Rugby House which then housed a library and a business called ‘Autobooks’. I used to get the number 44 bus from Preston Circus, usually on a Saturday to go to Black Rock. I remember diving off the top board for the 1st time when I was 12, this would have been in 1961. It felt like I was flying it was so high, don’t know exactly how high it actually was though. It always seemed such a big place to me with all the deck chairs and yes, I remember those awful metal coat hangers. I constantly smelt of chlorine in those days as there were no showers. Three times a week I swam in the Shiverers swimming club at The King Alfred and on a Saturday I would be in North Rd pool or in the summer it would be Black Rock. When I saw what they had done to it on a visit to Brighton I almost cried. I suppose the Marina makes a lot more money but to see the pool derelict was awful. Lots of happy memories though. Good old Black Rock. I remember playing ‘follow my leader’ at Black Rock and jumping off the diving boards. We had free season tickets after doing life saving exams. I also swam at Shiverers in the 1950s from Ovingdean. I was Glenys Williams then. My parents used to drive us from Heathrow to Blackrock in the fifties, quite often in our Morris 8. I remember they used to clear the pool so the teams could water polo. So we used to swim in the sea while that was on, which seemed to be warmer water. As far as I recall, I only ever went to the Black Rock pool once. It would have been around 1954 or 1955, when I was 5 or 6 years old. I was taken there by my auntie and uncle but somehow my swimming trunks were left at home. They bought me what was available in my size at the pool – a one piece wollen affair with grey and green horizontal stripes and knitted-in shoulder straps. I screamed the whole afternoon and refused point-blank to go anywhere near the pool for fear of being seen in a GIRL’S costume!